We featured the excellent Roa street art Urban Jungle video yesterday and tonight sees Roa move indoors with a solo show opening at The Pure Evil Gallery in East London. The windows of the gallery have been covered up all week and when we passed late last night the lights were still on in the space which suggests that Roa was working well into the night to get the show finished for this evenings opening. ROA started painting abandoned buildings and warehouses in the isolated industrial outskirts of his hometown - Ghent, Belgium. Fixating on the animals he found there; the wildlife became the central subject matter of his street work, inspired by their clever ability to adapt into scavengers in order to survive. 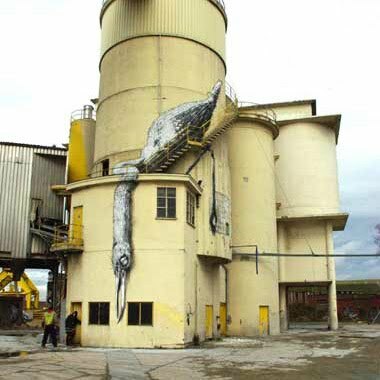 He used the dilapidated, coarse interiors and exteriors of the unyielding landscape as a canvas to portray his large-scale creatures. Roa filled a vast abandoned warehouse complex of different chambers and exteriors with a menagerie of large-scale animals, creating an impressive spray painted zoo of city scavengers. His obsession went global when he took to the streets of New York, London, Berlin, Warsaw and Paris, prolifically painting his trademark cross sectioned animals wherever he went, locating them where they naturally invade the main city streets with their quiet yet powerful presence.